Armor Up is an amazing read and I felt inspired and uplifted by each chapter that I read! I honestly wish that I had had this book when I was a teenager. It is full of great advice and ideas all woven together with scriptures and quotes from the prophets. It is written in a straight forward manner and geared completely towards youth. It is even QR codes throughout for more learning! I loved the challenges to armor up at the end of each chapter to help you apply the principles you just read about. My husband and I read most of this book together and we thoroughly enjoyed it and laughed out loud at certain parts. I recommend this book to anyone who wants to become a spiritually stronger person, but I especially recommend it for any youth! I can't wait to put on my "gospel shoes", tell my hubby that I love him "with all my brain" and "uninstall any third-party apps" that may be causing interference from receiving revelation from the Holy Ghost. Armor Up is a must read!!! 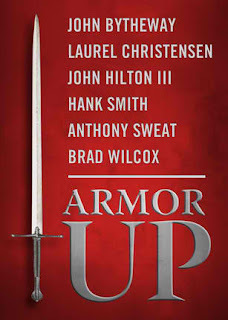 You can pick up your own copy of Armor up via Deseret Book.